In the safety of her adoptive father's estate, south of London, Felise Scelfton is raised oblivious to the power of her beauty and rumors of her dowry. But when the knights of Windsor court brandish their swords and bid for her hand, Felise realizes she'd better keep her flirtatious tongue in check, lest her jests be taken as vows. Little does Felise know that King Henry II has already decided her fate - his royal command gives her hand to Sir Royce Leighton, the scarred and brooding lord of Segeland, in order to seal a political alliance. Despite the arranged marriage, desire blooms between the newlyweds and Royce finds his bitter memories fading in the presence of his alluring and nurturing young wife. But the King hasn’t had his last word just yet, and old suitors seek revenge. Court scandals are never simply forgotten and Felise and Royce must decide if their love can withstand the cruelest of betrayals. 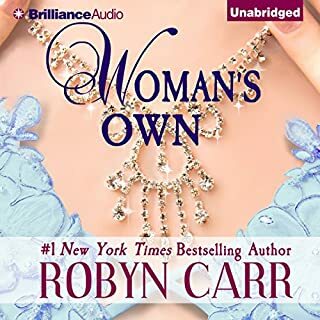 ©1985 Robyn Carr (P)2012 Brilliance Audio, Inc.
Not your run of the mill Historical Romance . A little slow at times, but kept my interests to the end. The story begins at court in the late 1100's just before Elenore betrayed King John -- where the King arranged strategic marriages, where betrayals and intrigue ran rampant. Anne Flosnik gave a great performance. romance and intrigue, it doesn't get much better, especially with a narrator as good as this one. 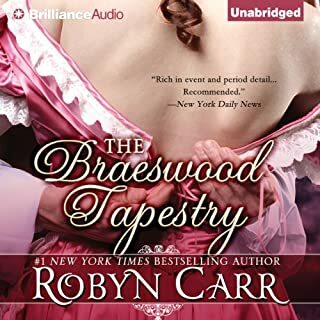 I was not impressed with previous Robyn Carr historical romance books, but I took a chance on this one and I was not disappointed. The narrator was perfect, the story moves quickly and the romance had just enough heat. If you like historical romance you will enjoy this one it's a easy read. 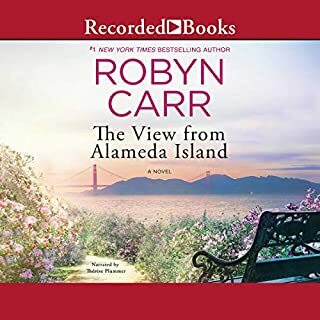 I am a huge fan of Robyn Carr and while I might enjoy this story otherwise, the narrator is unbelievably horrible...I will not be finishing this story!! As I have loved all of her other stories and have heard 25, at least, I am voting that the story was excellent but, again, this bears repeating, Anne Flosnikj did a horrible job with this story!!! Historical romance is not Carr's best format. She does fantastic with modern day romance, witness the Virgin River series, but not here. The story was too long, possibly in attempt to build historical scene setting. That really doesn't contribute. The story was good but could have been better developed in itself. Flosnik is a narrator you either love or hate. I love her. First audible book, enjoyed the story line! What did you love best about The Troubadour's Romance? What was one of the most memorable moments of The Troubadour's Romance? entire read was memorable since this was my first audible book! Again a very well written story by Robyn. Her stories are always intriguing and makes you feel you are there living the story right along with the characters. COULD NOT PUT DOWN!!!!! LOVED THIS BOOK!!!!! First off --- I LOVED THIS BOOK! I could literally barely put it on pause to work. I was so enraptured in this beautiful and exciting story that I found myself day dreaming about what was going to happen next. Now...I am not a fan of Anne Flosnik. She is one of my least favorite narrators. In this book she does a better job than most of the others I have heard her narrate. I don't like her male voices because she makes them sound pretty old but for some reason it didn't seem like as big of a problem for me in this book. I do not read Carr's modern day romance, only historical / regency. So those who say this is not one of her best comparing it to her modern day romance books may be right, but I have read several of her historical / regency novels and this is BY FAR MY FAVORITE! I found myself smiling to myself while listening. I even teared up on occasion. This book tugged at my heartstrings and made me run the gamut of emotions. While it is appropriate...the name of this book kept me from it for a while. I'm not really sure why, but I guess I thought it would be a romance about a Troubadour (who I guess I was assuming would a weak skinny man) but that is so not what this is! Rugged Knights, beautiful ladies, romance, excitement, mystery, plot twists, family drama....this book has everything! I would probably rate it PG-13 because the love scenes are not crude or overly descriptive but they are tasteful. Yes it is credit worthy....but its a bargain and I just bought it out right instead of using a credit! What would have made The Troubadour's Romance better? I don't care for the new book covers that Robyn is using. The covers without the people are more plesant to the eyes.